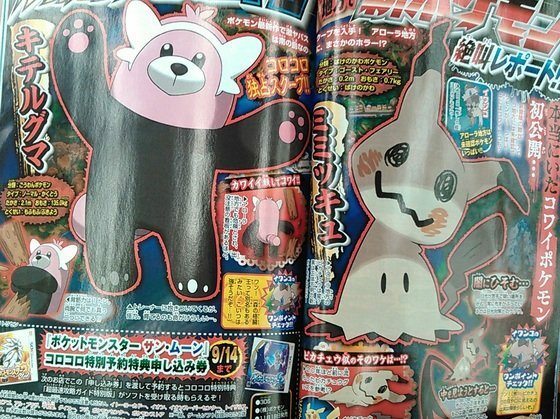 Kiteruguma and Mimikkyu are the newest additions to the Rotom Pokédex in Pokémon Sun and Moon, after CoroCoro Comic has once again landed on subscribers doorsteps early. It is said that those in the Alola region are scared of Kiteruguma, placing signs that warn that the bear Pokémon is nearby. The Normal and Fighting-type Pokémon has the abilities Fluffy and Klutz, and is known to be incredibly strong as it can break anything in two. While it likes to hug its trainer, raising one will put your life at risk. Mimikkyu is a Ghost and Fairy-type Pokémon with the Disguise ability. It hates sunlight and prefers to live in dark places, therefore it is believed that the cloth that it covers its body with is an effort to avoid the sun. Those that try to remove it are said to become afflicted with an illness.